Scott Harrison: Charity: Water Founder on Hedonism, Redemption and Service. Scott Harrison was living a life that was as close to pure hedonism as you could come. He was on top of the world, getting paid to party and living utterly (and destructively) in the moment…in the worst way. Eventually, falling apart physically and emotionally, Harrison found himself wondering, “what is the exact opposite of the life I’m now living?” And, then, remarkably, he set about living that alternative path. Paying to serve on a floating hospital ship off the coast of Liberia, he reconnected with a deeper mission to help others, with water as his focus. Scott then founded and is the CEO of charity: water, one of the fastest-growing non-profits in history, that has mobilized over one million donors around the world to fund over 28,000 water projects in 26 countries that will serve more than 8.2 million people. 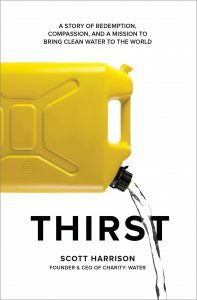 This journey is detailed in his powerful new book, THIRST: A Story of Redemption, Compassion and a Mission to Bring Clean Water to the World. In today’s conversation, we dive deep into his personal journey, and also his current vision for both charity: water and the world of philanthropy in general. BOMBAS: Get 20% off your first order, visit bombas.com/goodlife.